白ハット: I just read that the Earth's North magnetic pole is drifting rapidly. 男: Oh no! 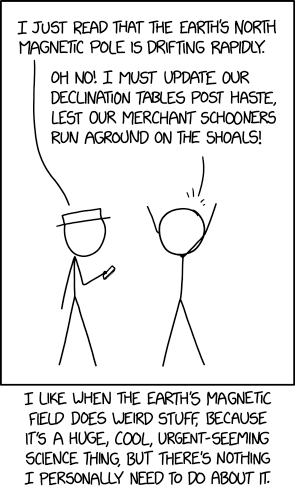 I must update our declination tables post haste, lest our merchant schooners run aground on the shoals! Alt-text: People keep trying to come up with reasons that we should worry about the magnetic field collapsing or reversing, but honestly I think it's fine. Whatever minor problems it causes will be made up for by the mid-latitude auroras.